The patient food kitchen on level B2 in University Hospital opened in 1986 and utilizes the “cook-chill-reheat” food production method. This process has been replaced in many hospitals with an on-demand “room service” approach to nutrition that enables patients to have more control of their environment. This process is already in place for pediatric patients in C. S. Mott Children’s Hospital and will be utilized in the new C. S. Mott Children’s and von Voigtlander Women’s Hospitals currently under construction. 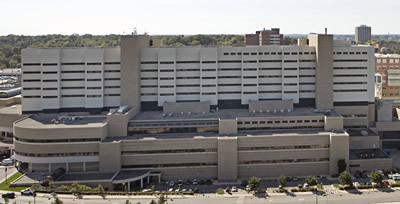 This project will renovate approximately 13,000 gross square feet on level B2 of University Hospital to allow the shift of Food and Nutrition Services for adult patients at University Hospital and the Cardiovascular Center from cook-chill-reheat production to the room service method. Food service operations will be relocated to the North Campus Research Complex during construction.